"Trouble starts from little things. Often from some forgotten natural tendency." It's impossible to talk about Fritz Lang's The Woman in the Window (1944) without talking about its famous ending. I'm not going to even try. You've been warned. Years ago I taped this film off of TCM and watched it with my mother. We were completely engrossed in the film and developed a growing concern for Edward G. Robinson's character. As the movie progressed we knew there was no way out for him and panic started to set in. He was getting deeper and deeper into a bad situation. What was going to happen to this poor sweet man? All he did was admire a portrait in the window. How did he get into this mess? Just as the film reached its climax we held our breath. When the ending came and we saw it was all just a dream, we breathed out a huge sigh of relief. My mother still talks about the film to this day. Sometimes she doesn't remember the title or the particulars of the story. But the ending, she'll always remember that. It's the one instance where a movie becomes its own hero and saves the audience from falling off the precipice into heart ache. And we're grateful for it. The Woman in the Window stars Edward G. Robinson as Richard Wanley, a professor of criminal psychology. With his wife and kids away on vacation, Professor Wanley spends time with his professional peers, including district attorney (Raymond Massey) and Dr. Barkstane (Edmund Breon). All three men are going through a mid-life crisis of sorts. They all have one thing in common: the admiration of a beautiful woman whose portrait is displayed in a shop window. One evening Wanley, as he stares at the portrait, sees a reflection. It's the portrait's subject, Alice Reed (Joan Bennett). What starts as an innocent flirtation ends with Wanley at Reed's apartment and a dead body. Reed's rich boyfriend tries to kill Wanley and an act of self-defense, with the help of Reed passing a pair of scissors to Wanley, will easily be misinterpreted as murder. The two plot to dispose of the body but they've gotten more than they bargained for. Reed must face her beaut Heidt (Dan Duryea) who catches wind of what happens and wants to be paid in return for his silence. And Wanley is implicating himself more and more as his district attorney friend handles the investigation. Wanley only sees one way out but luckily wakes up in time to discover it was all just a dream. Based on the novel Once Off Guard by J.H. Wallis, The Woman in the Window was adapted to screen by Nunnally Johnson. Johnson had become a successful script writer at 20th Century Fox. Wanting to expand his business opportunities into both writing and producing, he founded International Pictures, Inc. Johnson's first project was adapting Wallis' novel onto film. He had both Fritz Lang and Edward G. Robinson in mind for the project. After Marlene Dietrich and other actresses turned down the female lead, Bennett was offered the part. Johnson's daughter Marjorie Fowler, then Marjorie Johnson, worked as an editor on the film. Some major changes were in store for Wallis' story. According to Fritz Lang biographer Patrick McGilligan, "the novel had hinted that the female lead was a prostitute; Johnson made the character more ambiguous, but still obviously a rich man's mistress." Then there was that ending. In the novel, the protagonist, a professor of English not criminal psychology, deems all hope to be lost and commits suicide. This just wouldn't do for the movie version. Johnson wanted the original ending but got push back from studio execs. According to Johnson biographer Tom Stempel, suicide was a "story solution discouraged by the Production Code. [William] Goetz insisted that the story be revealed at the end to be a dream. Johnson felt that kind of ending was a cheat but Goetz was insistent..."
And wouldn't you know it, the ending worked. 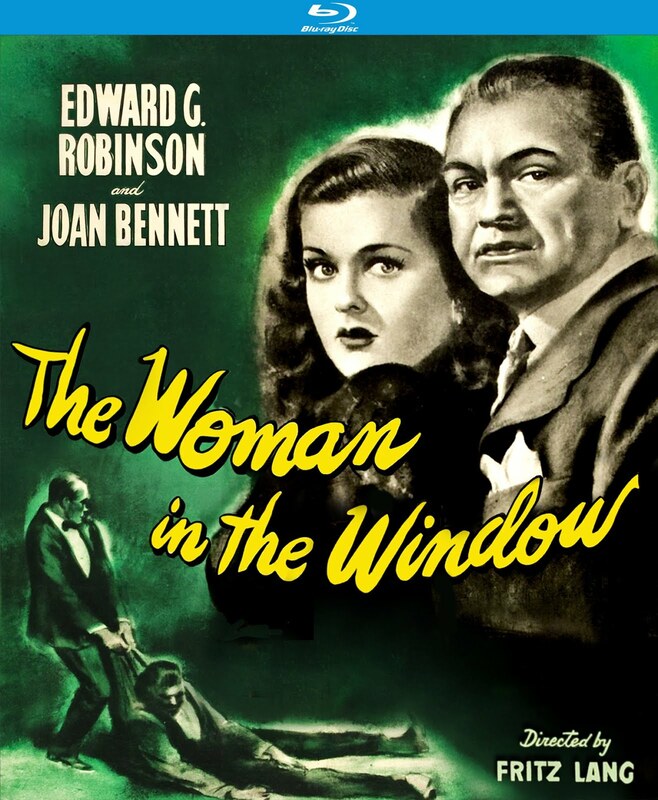 The Woman in the Window was a hit at the box office. While critics complained about the ending, they praised the film overall. According to McGilligan, quoting Fritz Lang, "the happier ending 'made a difference of a million dollars more in receipts." 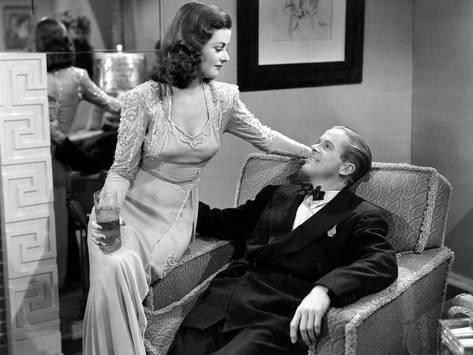 Upon the success of The Woman in the Window, Fritz Lang, Joan Bennett and Bennett's husband, producer Walter Wanger, teamed up to start Diana Productions named after Bennett's daughter from her first marriage. 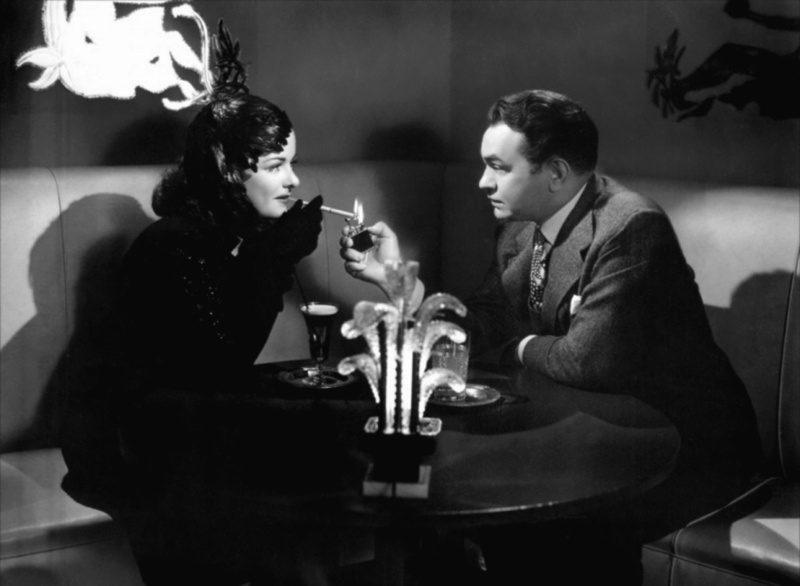 Their first production was Scarlet Street (1945) which reunites Woman's three main stars Edward G. Robinson, Joan Bennett and Dan Duryea in what proved to be an eerily similar story. Many classic film fans like to joke that Scarlet and Woman are essentially the same movie. Bennett and Lang collaborated on a total of 5 films which also include Confirm or Deny (1941), Man Hunt (1941) and the Diana Productions film Secret Beyond the Door (1947). This is notable because Fritz Lang was notoriously bad with his actors and many would give up working with him after one or two films. Stars like Brigitte Helm, Spencer Tracy and Henry Fonda wrote off working with Lang. Sylvia Sidney, who collaborated on three films with Lang, and Bennett seemed to be the only ones who were willing to endure working with the director. The Woman in the Window is a marvelous film. A taught film noir that tugs at your heartstrings. I love that Bennett's Alice Reed isn't a femme fatale caricature. There's more complexity than usual. Bennett really shines in this part which reminded me a bit of Jane Greer's character in Out of the Past (1947) but with more heart. Robinson does a fine job drawing out the audience's sympathy for his character. He's sweet and pathetic and we want to protect him like a baby bird that's fallen out of the nest. And Dan Duryea. Nice man in real life and pure evil on screen. A sign of true talent that he could so effectively play the opposite of himself. Robinson, Bennett and Duryea make for a dynamic trio on screen and are just as enjoyable in the next installment. And for the record, I loved the ending. Sure it's a stereotype of an old Hollywood cop-out but I bought it hook, line, and sinker. The Woman in the Window (1944) is available on Blu-Ray and DVD from Kino Lorber Studio Classics. The disc includes subtitles, audio commentary by film historian and film noir expert Imogen Sara Smith, and a variety of noir trailers. The film has been newly mastered in high definition and looks great on Blu-Ray. The package contains a reversible jacket with another poster design on the reverse side.